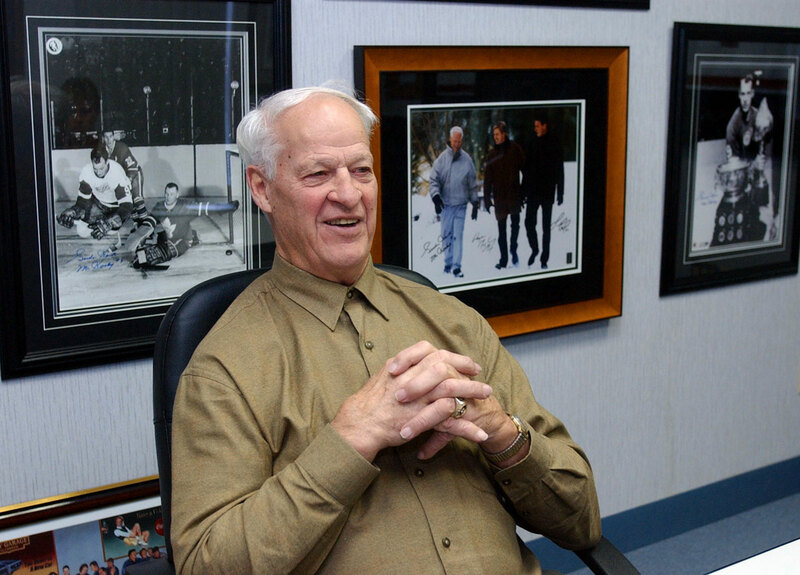 Rare photos of the late Gordie Howe by Sports Illustrated. 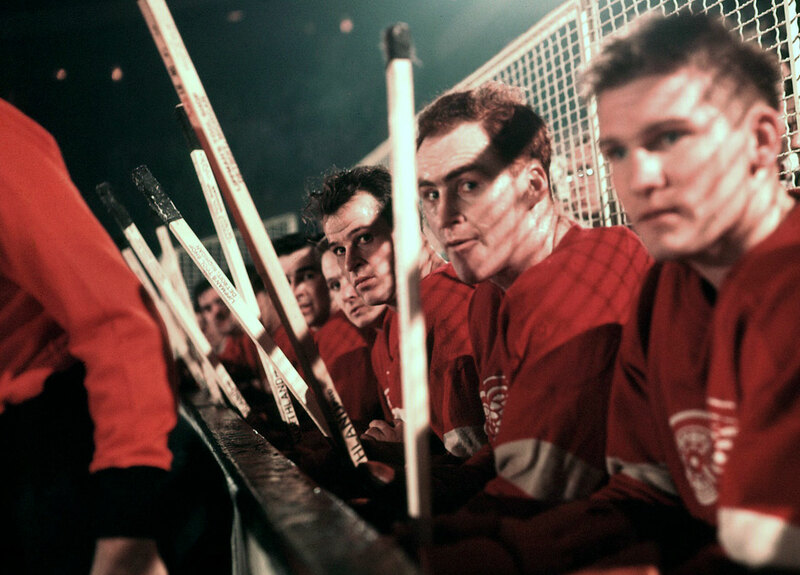 Gordie Howe sits next to Detroit Red Wings teammate Red Kelly during a game against the New York Rangers. Although just 26, Howe was already in his ninth NHL season. Detroit won its second straight Stanley Cup that season as Howe made his eighth straight All-Star team. 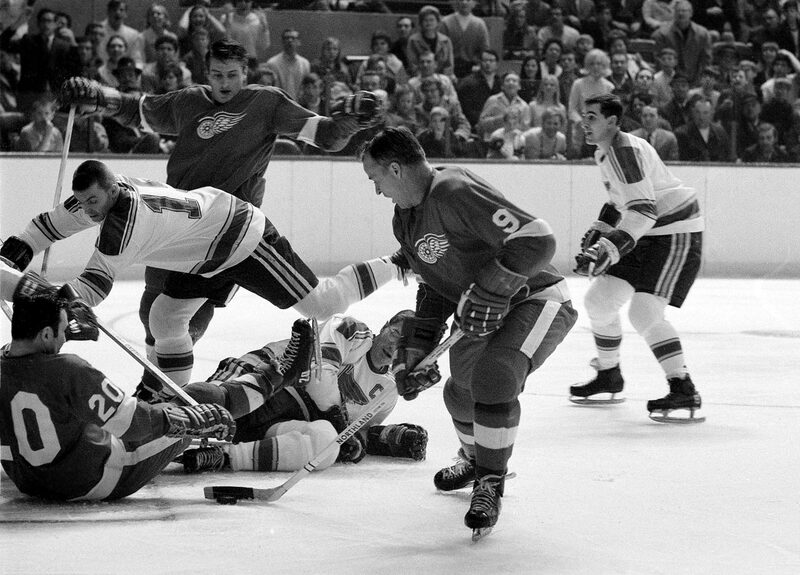 Gordie Howe and the Detroit Red Wings battle the Montreal Canadiens. He scored 33 goals and 77 points in 64 games that season and won the Hart Memorial Trophy as the NHL's MVP, his fourth of six such honors. His rugged style of play was summed up by the expression "Gordie Howe hat trick"—when a player has a goal, an assist and a fight in the same game. 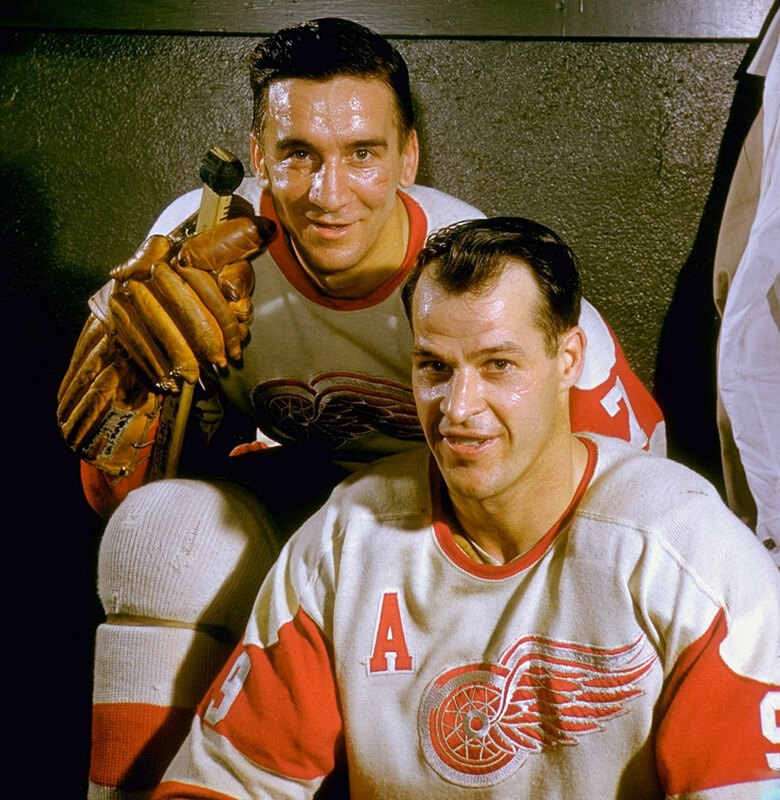 Gordie Howe poses for a portrait with Red Wings teammate Ted Lindsay in the locker room at Olympia Stadium in Detroit. Howe, Lindsay and Sid Abel were known as "The Production Line" and the trio finished first, second an third in scoring during the 1949-50 season. 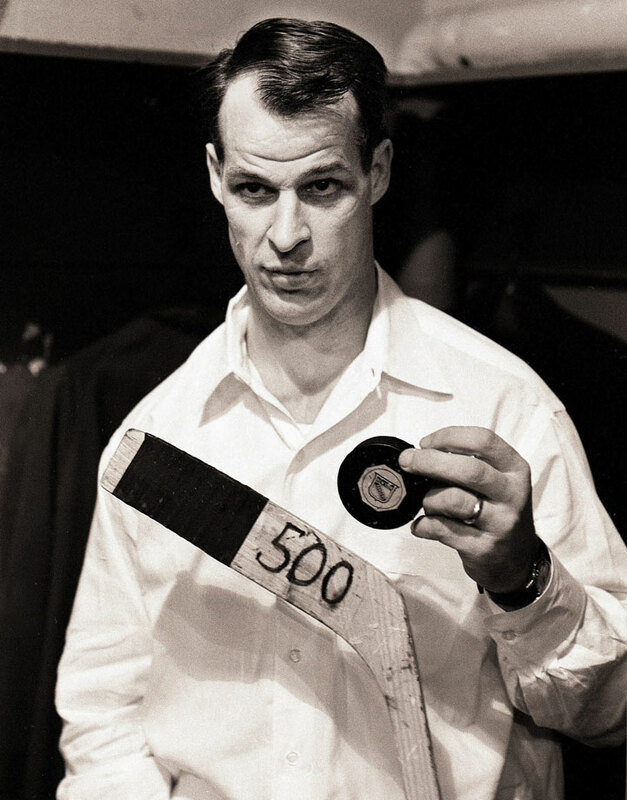 Gordie Howe poses with the stick and puck he scored his 500th career goal with following the Detroit Red Wings game against the New York Rangers at Madison Square Garden in New York City. 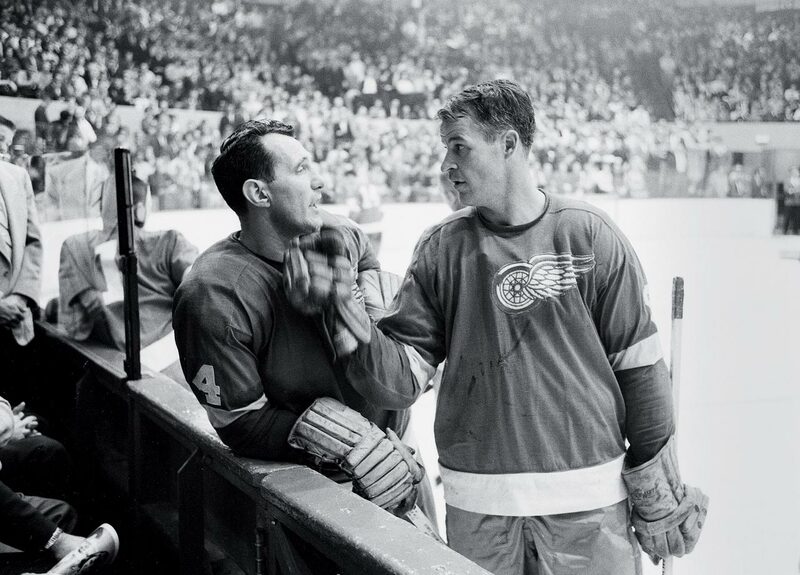 Gordie Howe and Bill Gadsby talk on the ice during a break in the action of a game against the Montreal Canadiens. 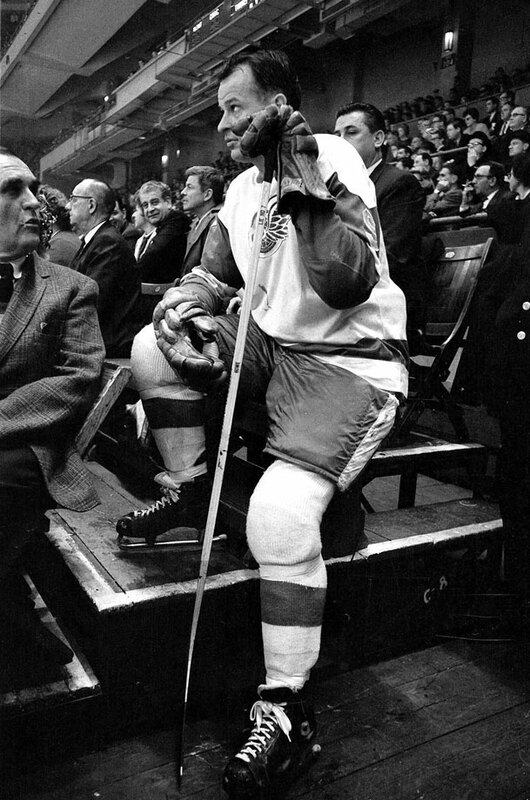 Gordie Howe takes a seat in the stands before the Detroit Red Wings game against the New York Rangers at Madison Square Garden in New York City. 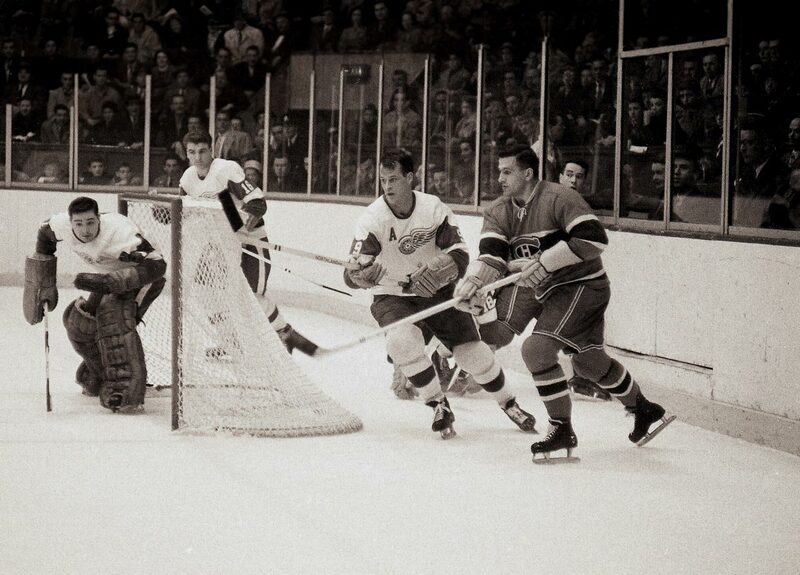 Gordie Howe looks to score around all of the clutter in front of the goal during the Detroit Red Wings game against the St. Louis Blues at Olympia Stadium in Detroit. 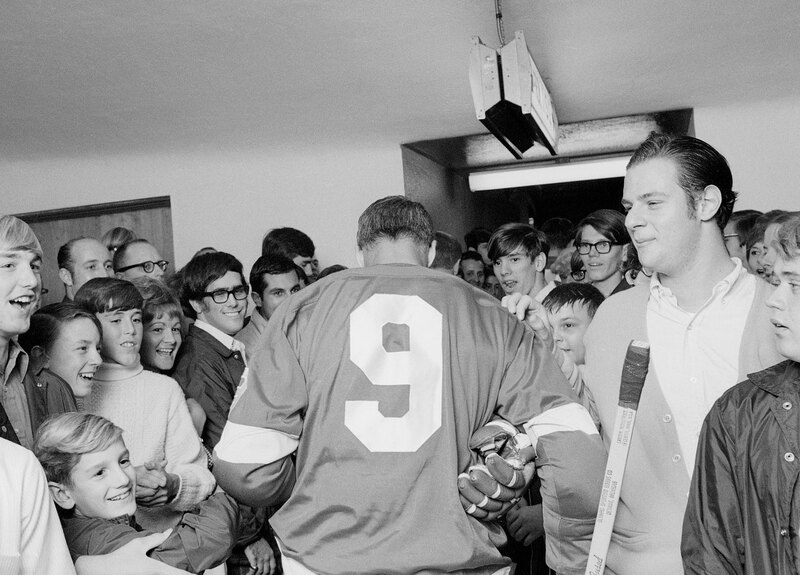 Gordie Howe is surrounded by fans as he walks from the locker room to the ice for the Detroit Red Wings season opening game against the Toronto Maple Leafs at Olympia Stadium in Detroit. Howe spent 25 seasons with the Red Wings and still holds eight franchise records, including games played (1,687), goals (786) and points (1,809). 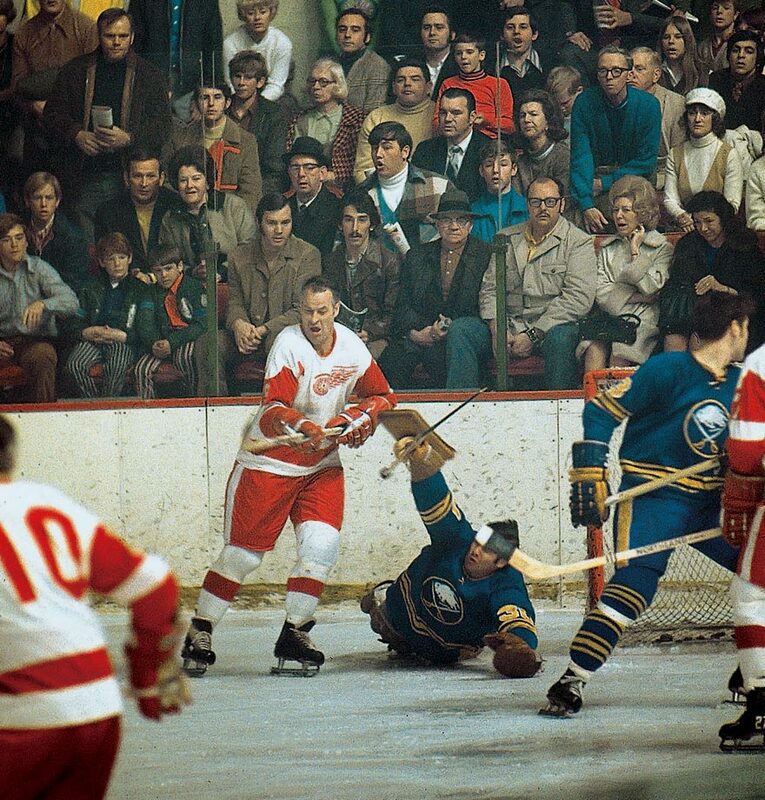 Gordie Howe looks poised to score against Buffalo Sabres goalie Joe Daley. The 1970-71 season was his last with Detroit. 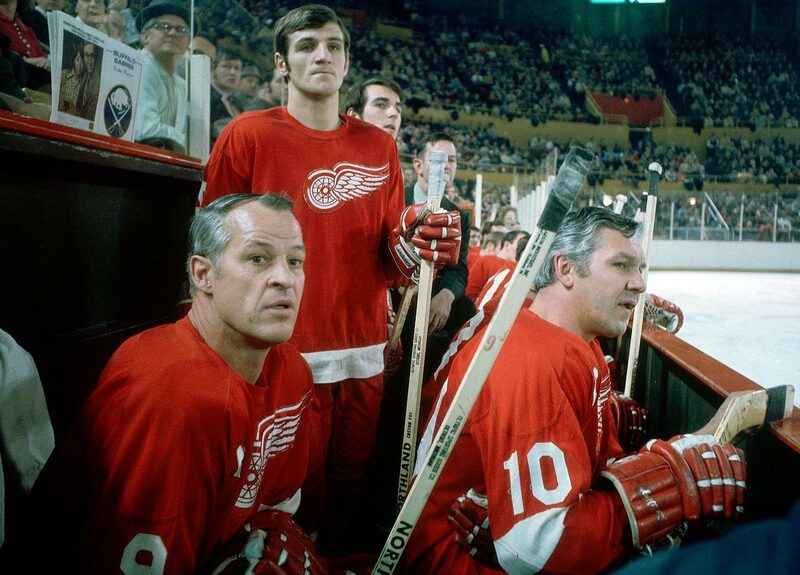 Detroit Red Wings teammates since 1951, Gordie Howe and Alex Delvecchio (right) watch the action from the bench during a game against the Buffalo Sabres in Buffalo N.Y.
After coming out of his two-year retirement in 1973 to join the NHL's new rival -- the World Hockey Association -- Gordie Howe watches from the bench as his Houston Aeros play the Alberta Oilers. He won the first of his two Avco Cup championships with the Aeros that season, ultimately producing 37 points in 26 postseason games during the two title runs. In addition to bringing Gordie Howe out of retirement, the Aeros signed both of his sons. Mark Howe (right) was the WHA's Rookie of the Year in 1973-74 while Marty (left) scored 90 points. 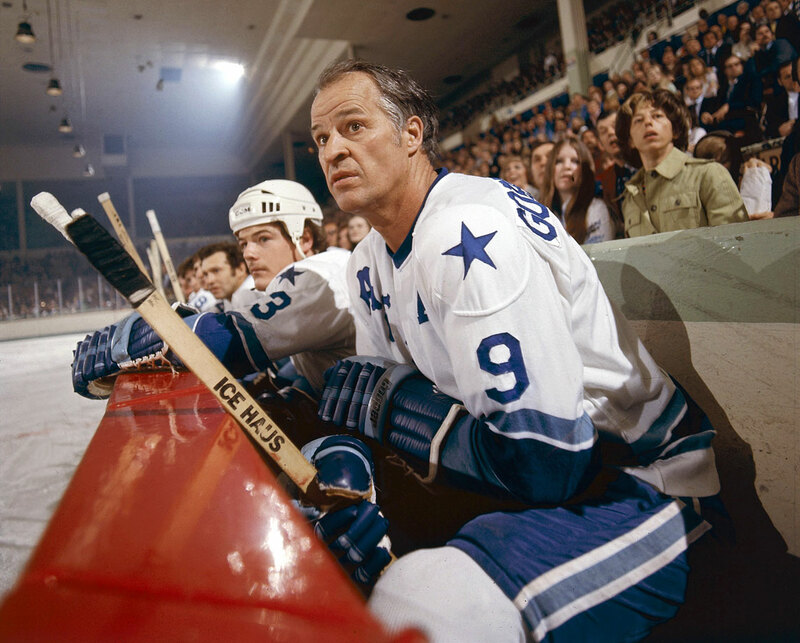 At age 45, Gordie Howe scored 100 points for just the second time in his career, during the 1973-74 season. 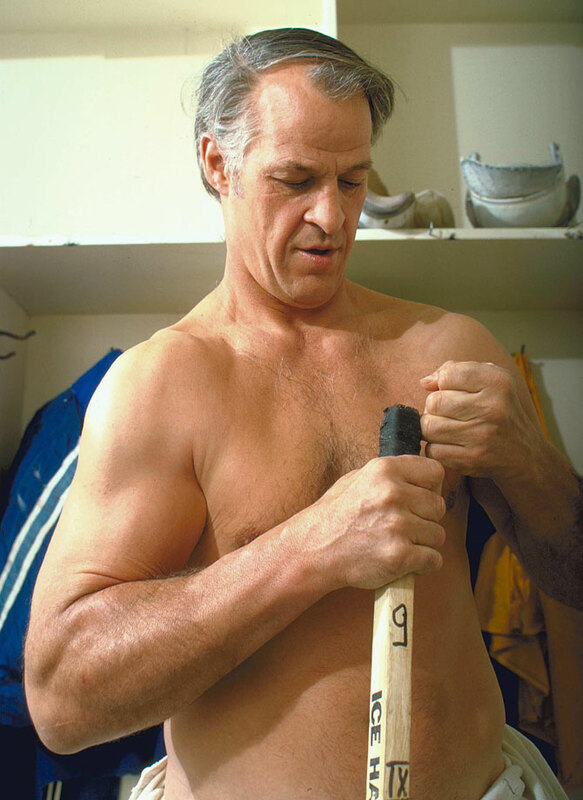 Gordie Howe tapes his stick before a game against the Vancouver Blazers. That season, he won the Gary L. Davidson Trophy as the WHA's Most Valuable Player. The award was renamed the Gordie Howe Trophy a year later. 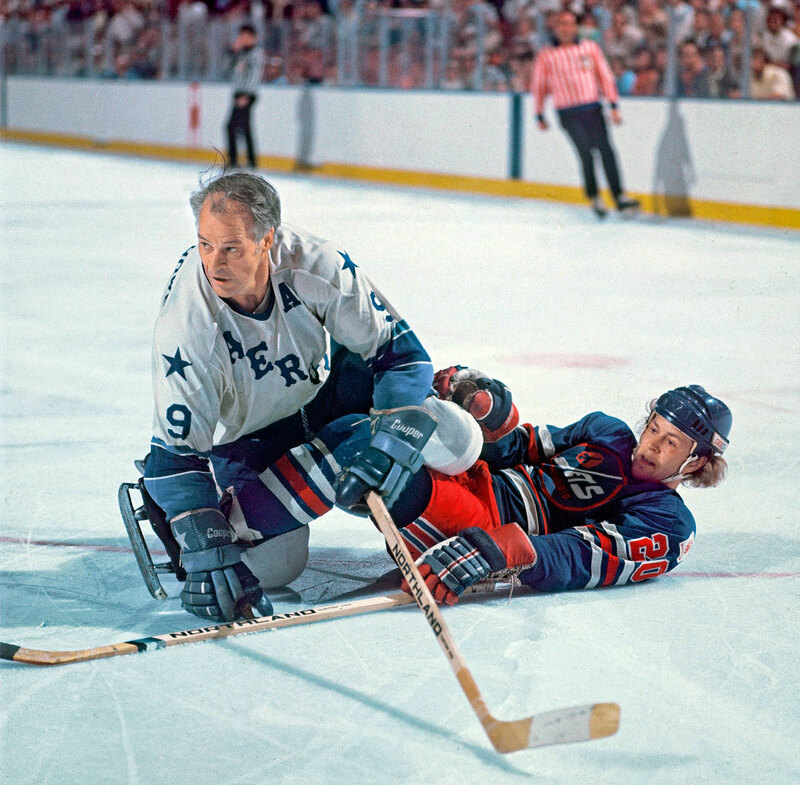 Gordie Howe follows the action after checking Willy Lindstrom during Game 1 of the WHA Avco World Trophy Finals between the Houston Aeros and Winnipeg Jets in Houston, Texas. 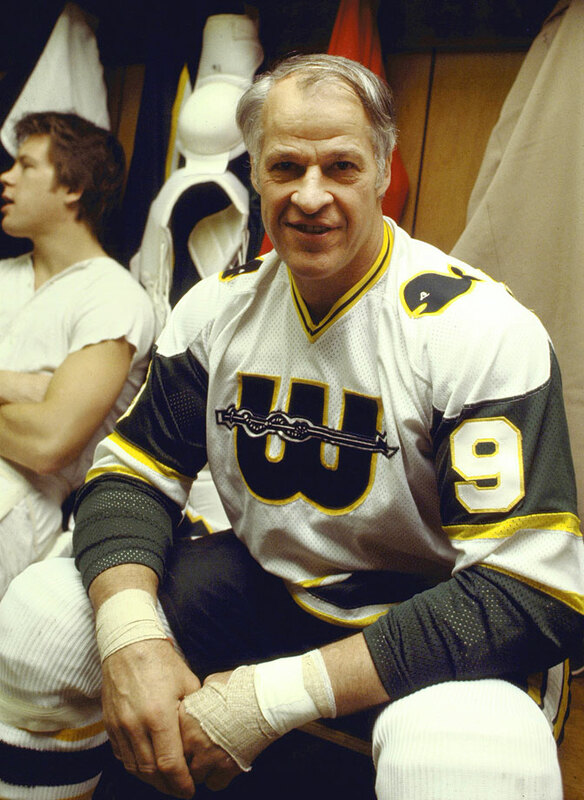 At age 49, Gordie Howe smiles before a New England Whalers game against the Quebec Nordiques. 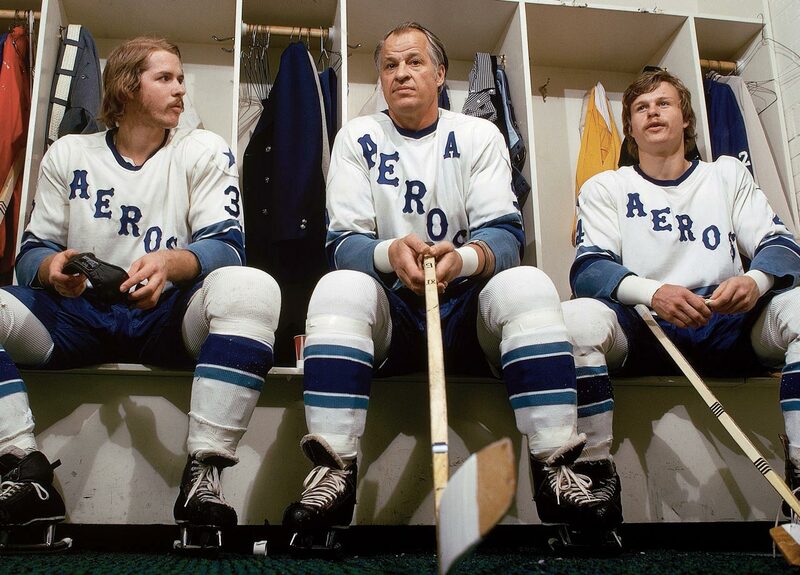 Howe left Houston for the WHA's Whalers after the 1976-77 season, moving with his sons Mark and Marty. 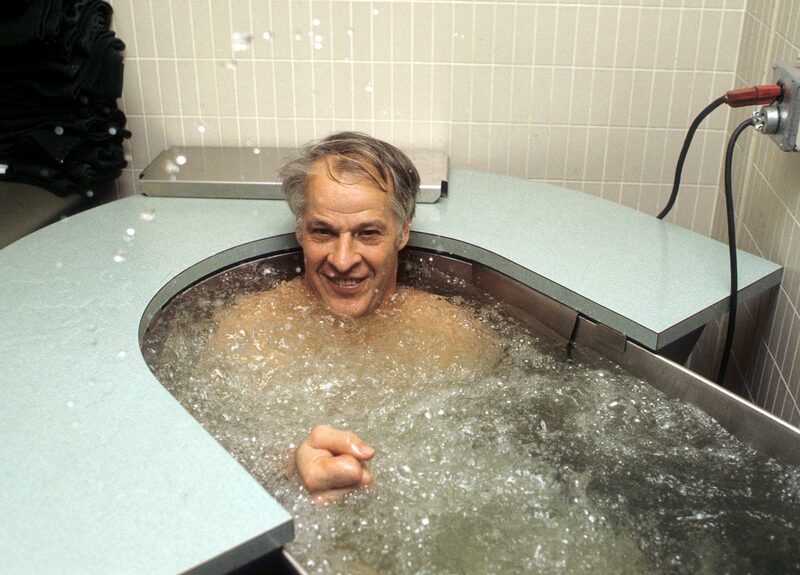 Gordie Howe squirts water while resting in a hot whirlpool. Despite his 49 years, Howe had an impressive season in which he racked up 96 points (34 goals. 62 assists) in 76 games. 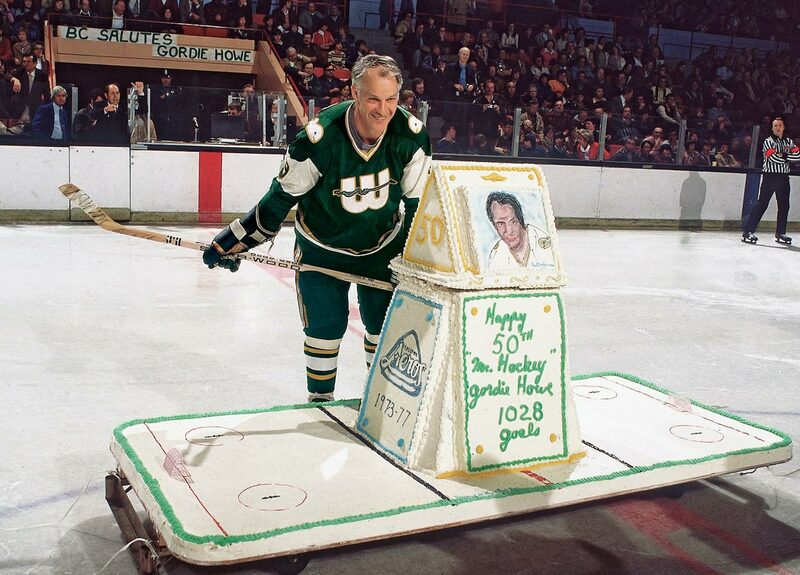 Mr. Hockey admires his 50th birthday cake before a game against the Cincinnati Stingers. 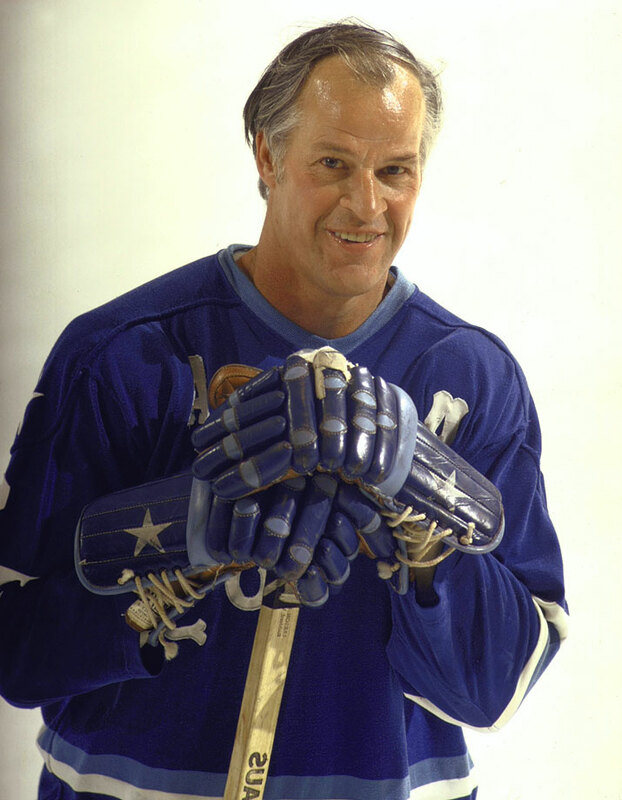 When Gordie Howe returned to the NHL the next year as the league absorbed the Whalers, he became the oldest player in NHL history, and he remains the only person to play in the league at age 50 or older. 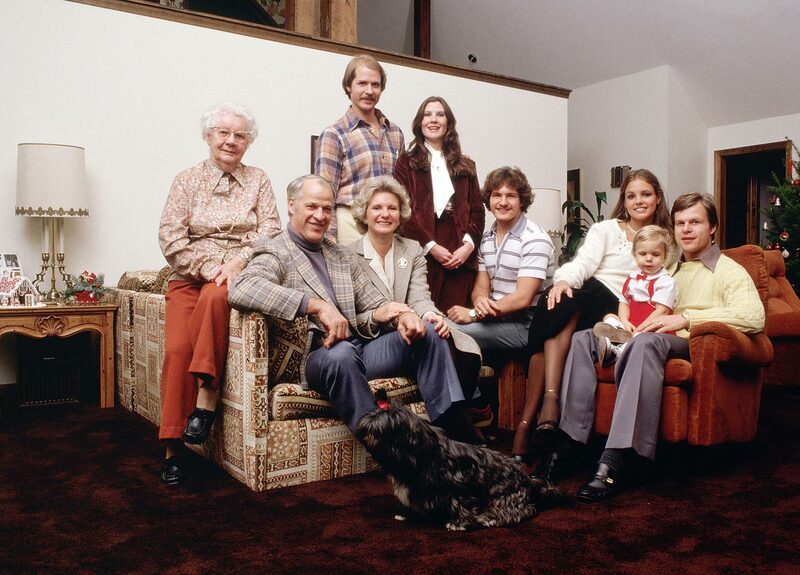 The Howe family pose for a portrait at home in Connecticut. 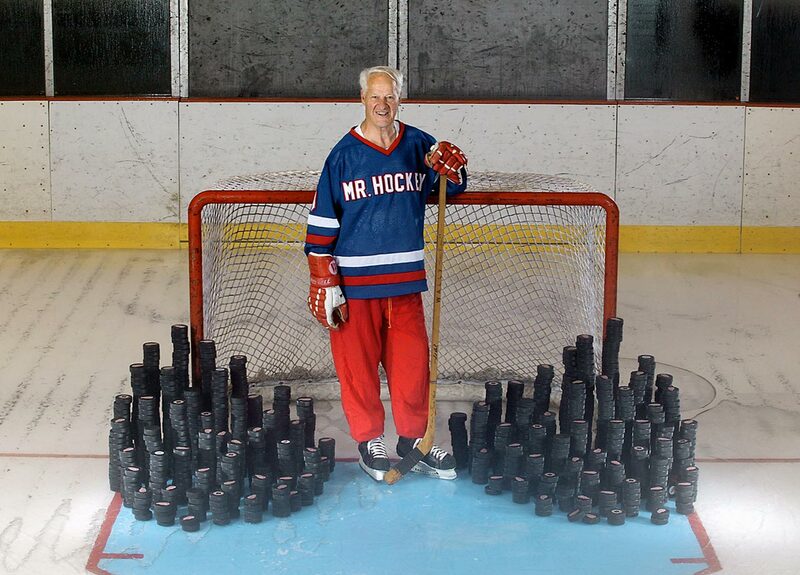 The 51-year-old Gordie was in the midst of his final season of pro hockey. He would later return for one shift with the Detroit Vipers of the International Hockey League in 1997 to become the first player in the sport's history to play professionally in six consecutive decades. 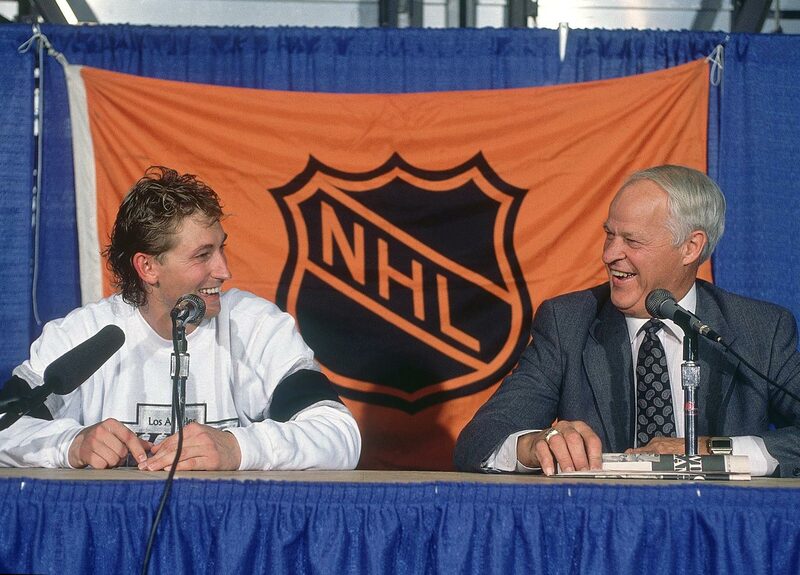 Wayne Gretzky and Gordie Howe share a laugh during a press conference after Gretzky broke Howe's career points record during the Los Angeles Kings game against the Edmonton Oilers at Northlands Coliseum in Edmonton, Canada. 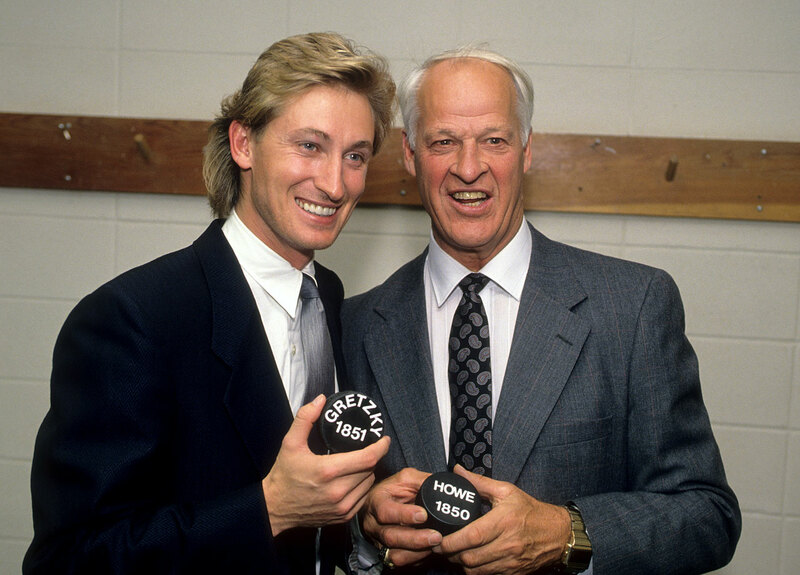 Wayne Gretzky and Gordie Howe pose together, holding pucks with their number of career points at Northlands Coliseum in Edmonton, Canada. 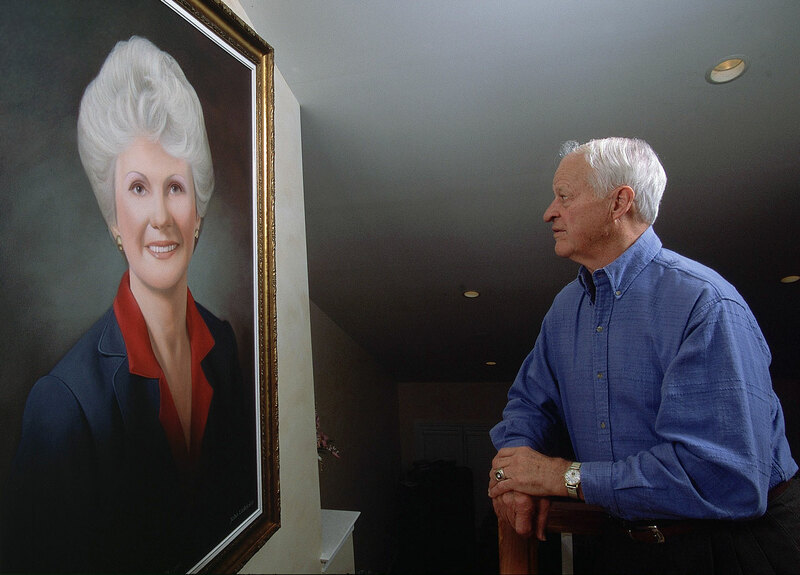 Gordie Howe admires a portrait of his wife Colleen, a sports agent who founded Power Play International and Power Play Publications to manage the business interests of her husband. The two were married for nearly 56 years, before her passing in 2009. 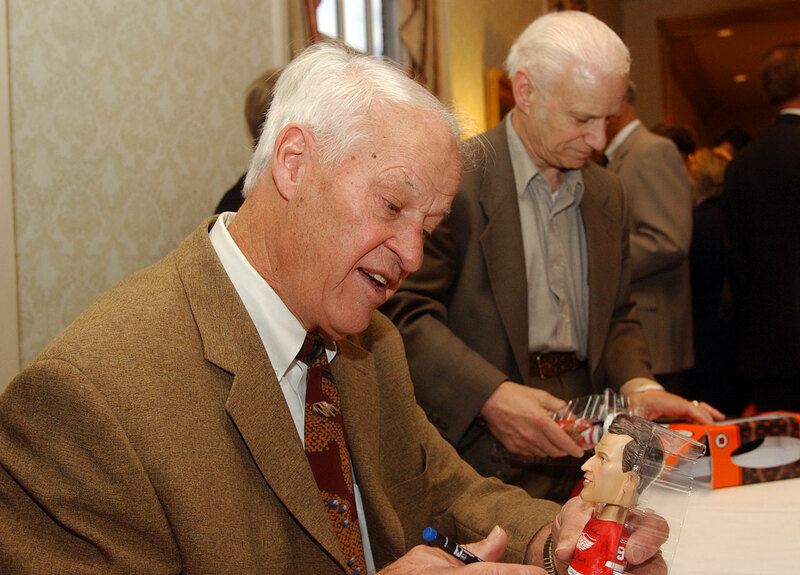 Gordie Howe autographs a bobblehead of Mr. Hockey himself in Deerborn, Mich.
Gordie Howe relaxes during an autograph session in Deerborn, Mich.